Check & Connect is a research-based intervention. Implementing it with fidelity helps schools and organizations optimize outcomes. To that end, we offer a comprehensive manual as well as several training and consultation options for sites considering or already implementing Check & Connect. We maintain a cadre of experienced, professional trainers to provide these services. The Institute on Community Integration at the University of Minnesota is the only approved provider of Check & Connect resources and training. All training participants will receive a copy of the Implementing with Fidelity manual (a $50 value). The first training option is our Preparation & Implementation Training. This 6-hour training is delivered in two formats. The first is a 1-day in person training or a virtual LIVE! Online format delivered in two 3-hour segments. 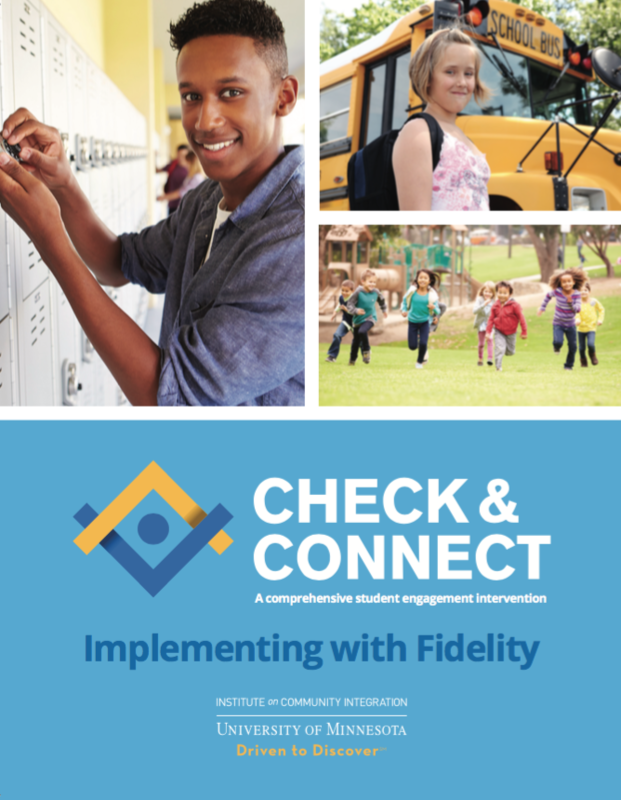 The Preparation and Implementation training provides administrators with the Check & Connect framework and guides participants through the steps for implementing with fidelity. The next option to launching trainings is our Comprehensive training. This is a 12 hour in person training delivered over two days.The Comprehensive training provides administrators and mentors with the C&C framework and guides participants through the steps for implementing with fidelity along with effective tools and strategies for the mentor role. Following the Preparation and Implementation training or the Comprehensive training, is our Mentor Training. This 12-hour in person training provides new or existing mentors with in-depth training on Check & Connect with the strategies and tools for there role. After sites have been implementing Check & Connect for 1 year, we offer a customized Fidelity of Implementation training that supports sites and ensures ongoing fidelity. If you are writing a research grant to fund Check & Connect or planning an evaluation of your implementation of Check & Connect and you would like technical assistance, please contact us. Browse the About Check & Connect section of this website, in particular the Frequently Asked Questions page and Using Check & Connect with Existing Initiatives. Download and print the Implementation Options & Tips (PDF), a matrix of pros and cons for each implementation option as well as tips for funding dedicated mentors and using existing school staff as mentors. Preview the Check & Connect manual, Implementing with Fidelity table of contents and sample monitoring sheet, both available for download. If you want more information, please contact us at 1-866-434-0010 or by email at checkandconnect@umn.edu.